When Can I Divide My Peonies? Peonies flower for two weeks in late spring or early summer, producing large blossoms in a variety of colors. Even though the flowering season is short, the plants provide a lush mound of foliage that adds color as a backdrop to other, later-blooming annual and perennial flowers. Dividing your peonies occasionally helps keep them healthy and also provides you with additional peony plants for the garden. Peonies survive for decades if left undisturbed. While the plants grow from a tuberous root similar to a rhizome, they do not require the frequent divisions of most rhizomes to prevent overcrowding. Dividing too often causes damage to the peonies as it takes them time to recover from any root disturbance. If you must divide a peony clump, do so every 10 to 15 years. Divide more often only if the bed is suffering from overcrowding issues. It takes many years for peony roots to become overcrowded. Symptoms include poor flowering and less abundant foliage growth. 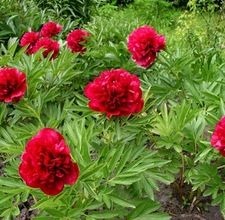 As the peonies begin competing for the limited water and nutrients in an old, overcrowded bed, the quality of the plants begins to decline. If your peonies fail to flower or produce only sparse, weak blooms, rule out cultural problems such as drought, shading and poor soil nutrition first. If there are no cultural concerns, the issue is likely overcrowding and you need to divide the peonies to thin out the bed. Divide the peonies in late summer — September works well. Waiting until near the end of the season ensures the plants have collected their fill of nutrition and sunlight during the summer, producing plenty of healthy roots. Do no wait so late that the peonies go dormant. Dormant plants are unable to initiate new root growth until spring so they recover slowly the year after dividing. By dividing while the plants still have a month or more of warmth, you give the peonies time to establish new roots, which makes them better able to survive the winter dormancy. Dig up the peony clump, damaging as few roots as possible. Some of the smaller, finer roots will break, which is unavoidable, but the larger tubers should be lifted undamaged. Cut apart the tubers so that each section has three to five growing buds and several roots attached. 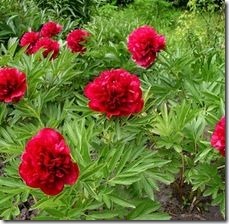 Replant the divided peonies immediately, as they do not store well. Plant with the eyes facing up, about 2 inches below the soil surface. The peonies may not bloom the first spring after division and may take up to four years before they recover completely and begin growing and flowering at their previous rate. « What Month Do Peonies Bloom in?